This past weekend was Anjali and Josh’s wedding – could the weather have been any more perfect? Thursday night, I had the privilege of being a guest at their Mehndi celebration. So much fun to experience all of the Indian traditions. Things went perfectly on Saturday, many thanks to all those involved, including Camargo Rental, La Petite Pierre catering and our trio of amazing musical acts: Quartet Zaria for the ceremony, Mohenjo Daro during the cocktail hour and Soul Pocket during the reception. All of the floral arrangements were made by Anjali’s mom and her friends – they were absolutely stunning. The bouquets and boutonnières were created by the always amazing Courtenay Lambert, and the cake was by BonBonerie. Paul Ludwig was the photographer. All in all it was a great day for a fantastic couple! My thanks to all those who helped it come together and to Anjali and Josh for being so great to work with. And to the cicadas, for staying underground and out of sight!!!!!! Update: Anjali and Josh’s wedding is featured in Cincinnati Weddings Magazine. 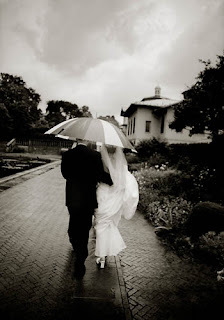 When is it most likely to rain on the day of your wedding? Well that’s a trick question, because the answer is ‘E. None of the above’*. It is most likely to rain on the day of your wedding when you don’t have a Plan B! If you are having your ceremony and/or reception outdoors, it is so important to have a Plan B on the ready, just in case. Unfortunately weather is one of the few components of any event that we can’t control, so you should always be prepared. Talk to the site managers of your ceremony and reception locations. They have seen hundreds if not thousands of weddings take place on their properties, so they are bound to have suggestions for uncooperative weather. For an outdoor reception, you most likely already have a tent. Talk to your rental company about side curtains – you’ll still be able to stay under the tent as long as the rain is light to moderate. Stock up on umbrellas for the bridal party so you’ll be fully covered once you leave the limo and are heading into the ceremony or reception. In the case of truly severe weather, the kind that would prevent you, your family or your guests from even showing up, your best Plan B is to consider Wedding Insurance. It will help you cover any extra costs of having to reschedule the wedding. You can get a very simple policy that covers a host of scenarios, and while the cost varies depending upon each individual policy and its terms, it is typically a very small price to pay for peace of mind. If you’re interested in learning more about obtaining wedding insurance, send me an e-mail and I will set you up with an agent who can help. *OK, so ‘A’ is also correct. Weather records indicate that May has the highest levels of precipitation in the Cincinnati area.